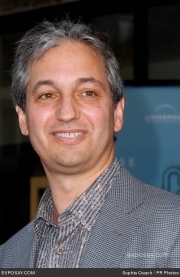 David Shore is a Canadian writer, best known for his work writing and producing in television. As a former lawyer, Shore became known for his work on Family Law, NYPD Blue, and Due South. Shore also produced many episodes of the hit cult television series Due South, before creating the hit show, House. Both of David Shore's parents were Jewish and his two younger brothers, twins Ephraim and Robert, are Aish HaTorah rabbis. He is the only member of his family involved in television. Shore attended the University of Western Ontario for his undergraduate studies after graduating from A.B. Lucas Secondary School with distinction. He subsequently attended the University of Toronto for his law degree in 1982. Following his education he initially worked as a municipal and corporate lawyer in his native Canada before he moved to Los Angeles to break into television. He sees this as a lateral move, as he did not consider being an attorney an uncreative occupation. He wrote for the television series Due South — about another Canadian transplanted in America, albeit a member of the Royal Canadian Mounted Police Force — before he became a producer on the ABC drama NYPD Blue. His work on that series was nominated for two Emmy Awards. He then moved on to the series Family Law, Hack and Century City, but these were not commercial successes. In 2003, producer Paul Attanasio — who had previously worked with NBC on such shows as Homicide: Life on the Street and Gideon's Crossing — approached Shore to request a procedural, as he knew the network was looking for another one to follow up on the success of Law & Order and to imitate CBS's success with CSI and NCIS. Attanasio's idea was to apply the police procedural genre to a show about medicine. While in most procedurals the characters are secondary to the mystery, Shore claims to have realized that a medical procedural should place the mystery secondary to the hero. He therefore conceived of a hero similar to the iconic detective Sherlock Holmes. That hero was Dr. Gregory House, the main character of House played by the talented British actor, comedian and musician Hugh Laurie. Although NBC took a pass on the series, Fox picked it up, and by the end of the first season, it was their biggest new hit of 2004–05. Shore wrote or co-wrote five episodes of that first season, including its pilot and the Season One pre-finale, "Three Stories", in which he intricately wove the stories of three patients whilst also revealing the reason for Dr. House's limp and Vicodin addiction. The latter of these won the 2005 Emmy for Outstanding Writing for a Drama Series. Shore made his directorial debut on the series House by directing the Season Two finale "No Reason". Due to the success of House, Shore was granted a generous contract for a fourth, fifth and sixth season. It was renewed for a seventh season, which began airing on September 20, 2010. The sixth season began with a two-hour season premiere, titled "Broken" which he co-wrote. Shore and his co-writers won the Writers Guild of America Award for episodic drama at the February 2010 ceremony for the premiere. In 2009 he finished production of the short-lived police TV show Winters starring Famke Janssen. He lives in Encino Hills, California, with his wife Judy and their three children. Whole or part of the information contained in this card come from the Wikipedia article "David Shore", licensed under CC-BY-SA full list of contributors here.